October 18th, 1943. The Italian town of Colvi Vecchia, Italy. Not a pretty situation: war never is. The Italian town was largely occupied by German forces who fought doggedly. And wearily, the American infantry brigade sent a request for air bombardment. A horrendous situation. Only for some reason, the German forces chose a moment shortly after the message had been sent to retreat; to leave the town and its civilian population to the Allies. The troops rushed to their communications equipment to cancel the order for aeroplanes to attack. But the unthinkable had happened; all lines were down. There was no technological way to stop those planes taking off. But there was still hope, and it had wings. It was less than a foot long, and a plain jane as far as appearance went; but it had one overriding talent. It could fly home. GI Joe was a homing pigeon. In desperation, the American troops released Joe with his vital message. And as they watched him fly away and become a dot on the horizon, they could only hope and pray. It took GI Joe just 20 minutes to fly the 20 miles back to the American air base. He arrived, literally, just as the American bombers were about to take off. One small pigeon was able to prevent a tragedy. I have often been offhand about pigeons. I have besmirched their intellect, their girth, their patterns of behaviour. But I have been taking pigeon steps towards Emmaus, and the scales have fallen from my eyes. These birds deserve respect. And we should not forget what they – fat or thin, clever or no – are capable of. For who knows when one might need their services again? My startling change of direction on the whole pigeon question took place in a room in a low, 1940s hut at the code breaking mecca of Bletchley Park, a little village on the outskirts of Milton Keynes in England. Here, Alan Turing developed Colossus, the world’s first computer. Here, Ian Fleming worked in intelligence, and garnered the experience he later used in the exploits of Commander James Bond himself. And here, agents would leave, every so often, with a carrier pigeon in a box. Because in times of war and hardship, pigeons trump technology, let me tell you, every time. Air crew had a notoriously perilous job during the second world war. And it was the practice to take pigeons with them when they left on a mission. The reason being that when a plane ditches into the sea, or crashes, all the equipment which might help locate survivors is decimated. So; when a crew bailed out, they set the pigeons free. Winkie had gone out with the team of an American bomber which crashed off the coast of Scotland. The crew had sent desperate SOS messages but nothing had got through. Meanwhile Winkie had escaped from his cage and was heading for home.He arrived back at his loft shortly afterwards, battered, worn and covered in oil. The loft manager did some swift calculations and was able to work out that Winkie had travelled 130 miles; a search party was sent out, and located the crew – 128 miles from the coast. 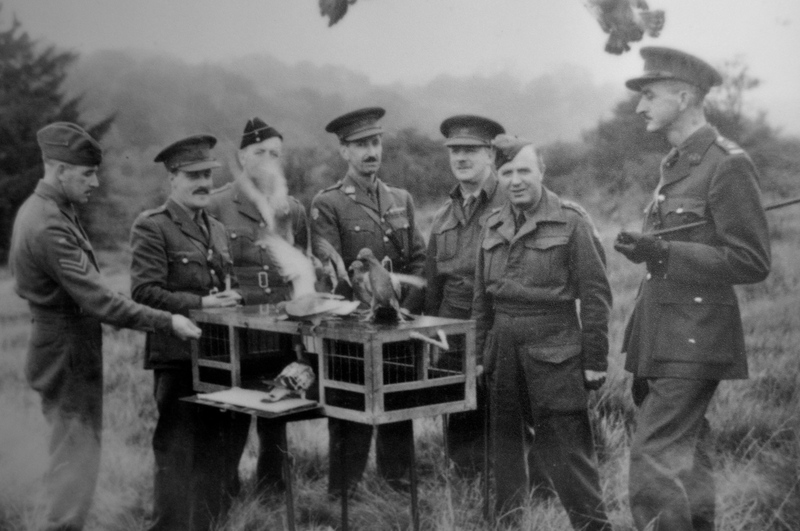 250,000 pigeons were used in the war effort; and 32 have received The Dickin Medal, the animal equivalent of the Victoria Cross. Sometimes, what a little bird can tell you can save lives. So next time you see a pigeon, doff your hat, or nod respectfully in their direction. Their brains might be small, but when the wires are down, you’d want a pigeon on your side. Written in response to Side View’s weekend challenge:A Little Bird Told Me…. which you can find here. Posted in Quirks of HistoryTagged animals, bletchley park, Dickin Medal, pigeons, wartimeBookmark the permalink. The pigeon steps towards Emmaus resonated with me. Emmaus is a chain of charity shops which is found all over France. It was set up by Abbe Pierre, a priest and Resistance member, in 1949.A neat link with the bravery of these avian wartime heros. It is, Roger! I never knew that – thanks. Theikr homing skills are amazing, yet we fill the atmosphere witnh electro-magnetic noise that is beginning to confuse them badly. poor little things. Really amazing stories reminding us once again that we constantly try to outsmart ourselves….keep it simple. Quite. We have evrything we need, if we but see it, Lou. I think there is a children’s book out about pigeons and the Civil War. You reminded me of it with this fascinating post. If memory serves me as it should (and often doesn’t), weren’t the remains of a carrier pigeon found in a chimney with a coded message still on it? Winkie escaped or was released? If released, he’d have carried a message giving the crew’s location. If he simply escaped, how would anyone have known when he escaped or from what direction he’d come? I’m confused. But no matter. I remain in awe of what was accomplished by these birds in the midst of so much manmade technology. I’ve asked one of the Homemakers at the Senior’s Residence (that I used to manage) to pass this on to a resident . Rita is in her 90s. She was born in the Ukraine, but married a Dutchman so she lived in Holland most of her adult life. She came to our island, following their daughter after her beloved husband died. At the residence, she feeds the pigeons with a ferocity that would create a heart murmur in a black belted soldier. When I told her our concern over the birdseed attracting rats (with the Homemaker interpreting in sort-of Dutch), I learned I was up against World War II. Thereafter she lost her knowledge of English the minute she heard “pigeons”. The flock grew and continues to grow. Her Homemaker and I gave up – how could we wrestle a heart so good and so intent upon saying thank you. I hear even the most tyrannical of the owners cannot budge her! The mighty little feathered friend soldiers on! Lovely stories and great credit to those birds, even if they were ‘doing what comes naturally’. With that in mind I totally venerate rescue dogs, in or out of wartime, who have a good idea of what they are doing and why, and go for it with dedication even though they also have quite a fair grasp of the danger involved. Somewhere buried in the deep recesses of memory I knew something about the use of pigeons during the war, but I really had no idea so many were employed. Amazing! My husband raised homing pigeons when he was a young boy, and I’ve always thought that was such a fascinating hobby. I love the photos you found to illustrate, Kate. What an interesting story! Fascinating stuff, Kate. You find the info and work it into a wonderful story. Thank you! I remember reading a story book over 50 years ago which was about a boy who raised homing/racing pigeons. Then they were commandeered by the army for the war effort, including his champion. The story was about the champion and the unfolding events. Winkie was a HEN, on board a British bomber. Great stories thought!